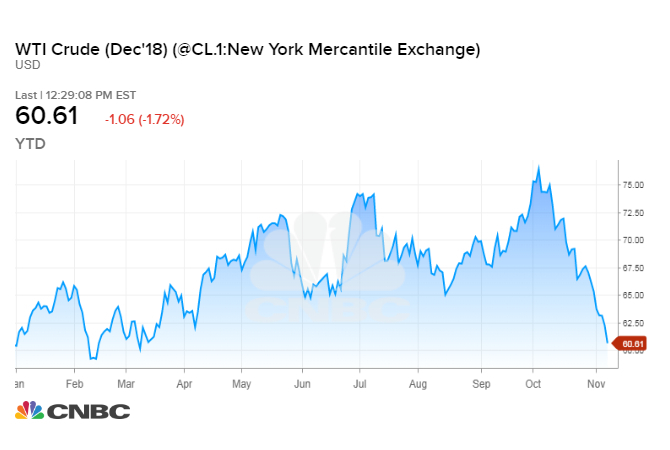 U.S. crude falls more than 20 percent from its four-year high last month, putting the contract in bear market territory. U.S. oil output is predicted to break through 12 million barrels per day by mid-2019. China's October crude imports hit a record 9.61 million barrels per day. "All three of them are continuing to pump at record levels, that's been ... part of what's causing oil to move into a bear market," Tamar Essner, director of energy and utilities at Nasdaq Corporate Solutions, told CNBC's "Worldwide Exchange" on Thursday. "I think the market is grappling with some fundamental uncertainties," she said. "We don't know if we are oversupplied or undersupplied." Forecasters also lowered their estimates for oil demand growth last month, taking some of the froth out of the market. CNBC's Jim Cramer said he sees a path for U.S. crude to fall to $40 a barrel as growth in demand moderates and supply rises. However, Chinese trade data released Thursday showed the country's oil imports rose to an all-time high at 9.61 million bpd in October, Reuters reported. Crude futures also drew support on Wednesday from a report by Russia's TASS news agency that Saudi Arabia and Russia are in talks to push a group of about two dozen oil producers to cut production. The group of OPEC and non-OPEC producers began cutting their output in January 2017 in order to end a punishing oil price downturn. In June, the exporters agreed to restore some of that production after their combined output fell more than they intended. A committee representing the group is set to meet this weekend and could make a recommendation to the wider group, which meets next month. Last month, the committee said supply is "very comfortable" relative to demand and warned that macroeconomic uncertainty could force OPEC and its allies to begin cutting output again.